— Our video series featuring Mike Simone, the executive training director for Men's Fitness and Muscle & Fitness, and Kelvin Gary, C.S.C.S., a personal trainer at Body Space Fitness. They'll demonstrate key exercises, elite nutrition tips, and secret "pre-hab" techniques that professional athletes use every day. 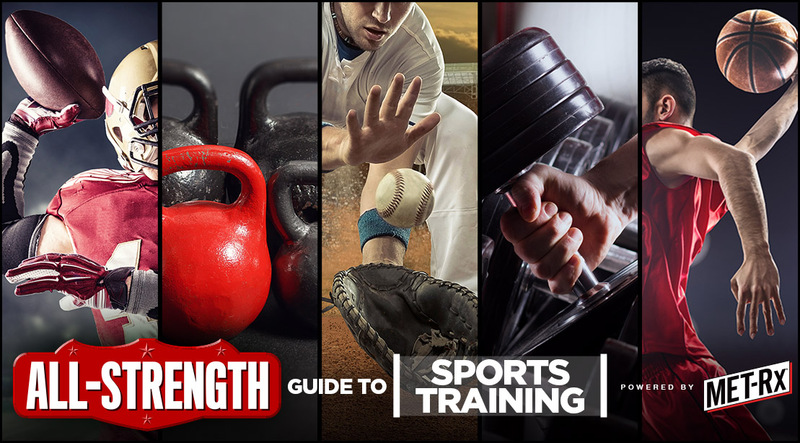 — The All-Strength Workout plan, with how-to guides to each exercise you see in the video series, so you can put all these training tips into practice (without a ton of specialized equipment). — Pro tips on building a powerful, explosive, and injury-proof physique that'll get you through any overtime, according to the best trainers in baseball, basketball, and football. Now get out there and make some plays. One-up your competition with dominating power, size, strength, and speed.